Summary: Two leading entries in the newly emerging utility belt category, the Naked Running Band and UltrAspire Fitted Race Belt are mesh and elastic waistbands that are chock full of pockets and attachment sites to carry your essentials on the run. They aren’t considered hydration belts because they come with no fluid containers, but they are suitable for carrying soft flasks or contoured bottles in addition to whatever gear you can stash or strap down. Before you decide which utility belt you should buy, you should start by asking yourself whether you actually want to use one. It’s a relatively novel design concept in gear (or is it apparel? It’s kind of a toss-up.) that has some distinct advantages and disadvantages over the products it is designed to replace: traditional water-bottle waist belts, and lower capacity hydration vests. The two primary advantages are storage and comfort. The running belts we’ve tested are essentially a continuous series of pockets and pouches of various sizes and configurations, along with external attachment mechanisms to carry items outside the belt. Since the vast majority of items runners carry on the go are “stashable” size, it’s easy to find a place for all your essentials. All the compartments are made of stretchy mesh material, so they can expand large enough to carry hydration flasks or scrunched-up Houdini-style jackets in addition to keeping small items like keys or credit cards secure. All of this cargo is held snug against the body by the elastic construction, and because there is no inherent structure to the belts, items inside the pockets naturally settle into the contours all around your body. The result is an exceptionally comfortable ride with virtually none of the bouncing you typically experience with a traditional water bottle waist pack. Because the belts distribute weight smoothly, and are made from super soft material without straps or buckles, you don’t develop hot spots during extended activity. And best of all, everything remains easily within reach; the most you’ll ever have to do is rotate the belt one way or the other to access all storage areas. There is none of the contortionism that is sometimes required with hydration vests. Here are the downsides: that locked-down fit is only possible when you have the right size, and because the belts are made as continuous loops, they only come in fixed sizes, so you have to be careful about selecting the right one. We found the appropriate running belt sizing was a pretty close match to our underwear waist size. Having fixed sizes prevents you from sharing the belt with family members or loaning it to friends, unless they happen to be the same size as you. The other cumbersome aspect of using a belt is that you have to put it on and take it off just like you do with a pair of shorts, pulling it all the way past your legs and around your feet each time. It doesn’t sound like that big of a deal, until you have to have to put it on in the mud, or until you catch your foot on the waistband while taking it off. And even though belts do an exceptional job of carrying cargo on your waist, they are hard to maneuver in and out of when the pockets are fully loaded, and it’s not uncommon for some items to tumble out during the transition. One final caveat with both of these belts is that in order to minimize weight and maximize breathability, there is no sweat barrier in any of the compartments. This means that if you sweat a lot and you are carrying items that you don’t want saturated like a phone or credit card, you need to put them in a Ziploc bag before tucking them in the running belt. With all that in mind, we’ll describe some key distinctions between the two models we tested. Naked Sports Innovations was an early pioneer in this category of gear – or apparel, or whatever we’re calling it – as their original Running Band was the first to gain widespread exposure among athletes looking for an alternative to the traditional means of carrying stuff on the run. The Running Band consists of three large mesh pockets, each of which has a pull tab for easy opening on the go. The external layer of the pockets is slightly higher on the waist than the internal fabric layer, to further ensure that items don’t accidentally spill out when accessing the pockets. The cut of the belt is generally cylindrical, with the top opening having the same circumference as the bottom. Because all three pockets are rather large, the Running Belt is ideal for carrying multiple water bottles or larger items like compressed jackets. External cargo storage comes in the form of two silicone-backed elastic straps that provide another place to carry a jacket, and are spaced in a way that is also ideal for tucking trekking poles. The interior surface of the straps is nice and sticky, but there’s no way to tighten them down for thinner items. One cool feature of the Running Belt is the presence of dual shock cords on the front that are spaced at the approximate width of a race bib, so you can attach your number to the belt instead of poking holes in your clothes with safety pins. We also like the presence of a key clasp for increased peace of mind about not dropping your ride home six miles from the trailhead. 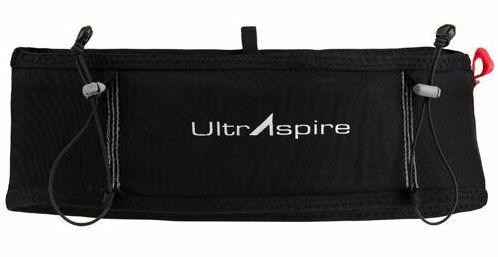 UltrAspire is another company with a passion for innovation; whether it’s hydration vests, waist belts, or lighting systems, you can rely on them to put a little different – and frequently better – twist on traditional designs. Such is the case with their Fitted Race Belt, which has some notable construction elements that distinguish it from the Naked Running Band. For starters, cargo space is divided into five compartments: three relatively large ones, and two reduced ones to keep smaller items more secure and easy to access. The large pockets can easily accommodate most smart phones, and one of them has a vertical zipper closure for added security. They are also large enough to carry UltrAspire’s Formula 250 bottles, or their new 550ml UltraFlasks, or any soft hydration flask up to 600ml capacity. Some of the pockets are accessible from the external layer of the belt, while others are accessed from the interior layer; it’s a bit tricky to keep track of which is which at first, but you’ll figure it out soon enough. External storage comes in the form of two dual bungee loops on the back side that can be cinched down for tightness around a jacket or a pair of trekking poles. There is also a single elastic strap with silicone backing on the front side that is meant to drape a stocking hat or pair of gloves through, but we found a bit of wriggling from these items in practical use. The best innovation on the Fitted Race Belt is the refinement of shape and contour for an even more locked-down fit around the waist. This is accomplished through conical construction, as the top ring of the belt has a smaller diameter (by roughly 25mm) than the lower ring. This design allows the belt to rest more comfortably on the hips and provides even more stability of ride; the tradeoff is the top opening is that much narrower when you’re trying to get your big muddy shoes to go through it. Both items reviewed here are now available for purchase; The Naked Running Band is at www.nakedsportsinnovations.com, and the UltrAspire Fitted Race Belt is at www.ultraspire.com. I have the UA belt and like it a lot. It’s very comfortable and holds a 500 ml soft flask without bounce. I forget about it after a mile or so. I’m 6’4″, 205 pounds, 35″ waist and found the Large fit well, but the X-Large was too big. The only negative is the bungee cords are not that strong and my z-poles tend to stretch them and bounce. I really appreciate the belt I have, especially for my running commute to work. It holds my cell phone, cards, keys, soft flask, and as I warm up I can take off my jacket/shirt/gloves and stow them without stopping. During Ultra events the bands on the back hold my trekking poles really well – I simply rotate my belt around me so the straps are in front, put them in, then rotate them back around. This way, the poles are not flopping around in front of me like the many race vests will do, and if I trip and fall, they won’t hit me in the face or break a rib. Also, once the belt is on, you do not have to take them off, like if you have to stop to go #1/#2, you just pull them up onto your belly above your shorts and pull the shorts down. 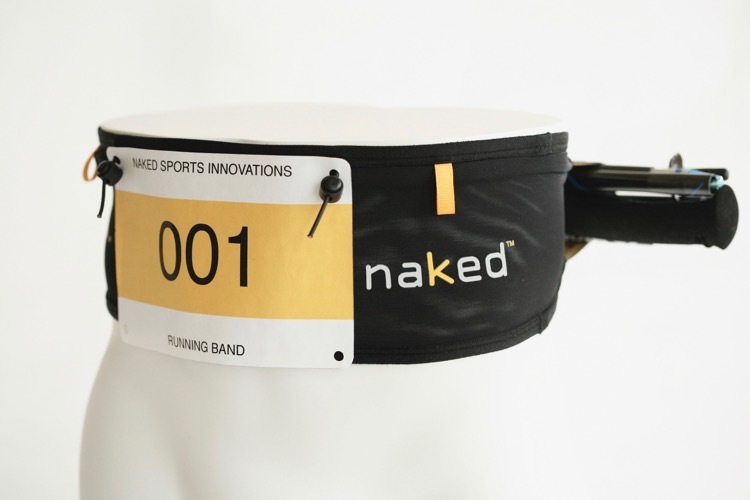 My go-to is the Naked Running Band, and I like the grippy inside of the pole-holding straps. The bands do take some time to get used to, as they are snug around your internal organs/digestive system. I’ve been really impressed with these. I’ve got the Naked and love how much stuff I can carry with minimal/no bounce. Normally I run/race with a dual water bottle belt; this allows me to carry more, less slosh, more comfort. The advantage over a hydration pack (other than faster refills at aid stations) is the reduced heat load on your core. I’ll be using mine all the way up to 100 miles, no problem. My only gripe with the Naked is I got their soft water bottles, and the lids are not nearly as easy to get on right every time as a regular bottle, resulting in occasional mass leaks. Easily fixed, but if you’re at a rush at an aid station, not going to be helpful. I’m hoping this is not the case with other soft flask brands. 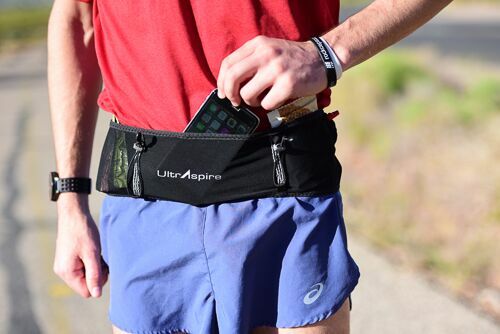 UltrAspire waistbelt is literally my favorite piece of running gear! I have tried using waistbelts in the past and never could get them to stay in place. This bad boy does not move at all…actually forget i have it on after my runs sometimes. It works for a quick run when you need to carry keys or phone. Great for the ultras i have used it on to carry nutrition too. Gamechanger for me for sure! Has anyone used these to carry more than 500ml? Here in the South, I find I often need more water if the aid stations get more than an hour apart. I used the Naked Running Band with two 500 ml softflasks. That worked still OK but than do not put too many other ‘heavy items’ in the Band. It is great to go out for a long trailrun with all your stuff securely around your waist and have your back just in the open to feel the wind … and that is what the Naked Running Band delivers. I wrote about my experiences on my weblog.